While HBO wonders what the hell they're going to do if (or when, more likely) their hit show catches up to the books, the network is already thinking about more Game of Thrones TV — author George R. R. Martin says the network is considering a prequel series, possibly based on his Dunk and Egg short stories, which are set 90 years earlier. Well, I have been writing for a number of years a series of novellas set in the same world, the world of Westeros, but a hundred years earlier, about two characters called Dunk and Egg. And I published three of those novellas, The Hedge Knight, The Sworn Sword, and The Mystery Knight, and I have in mind about nine or ten more novellas about the adventures of Dunk and Egg. So we have been playing with the idea of doing those as prequels. They would be prequels, in a sense, they’re a hundred years earlier but in the same world. They’re somewhat lighter in tone than the main series, a little more adventurous. 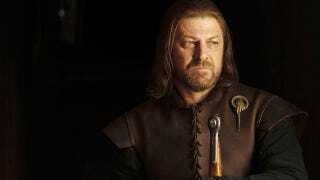 But my fans love them and I love the two characters too, and it all ties into Westeros history. So maybe that will be what we’ll do. I can't really blame HBO (or Martin, for that matter) for trying to put out anything with the words "game," "of" and "thrones" attached to it right now, I still think they should make one prequel season of the show, covering the events that led up to and directly after Robert's Rebellion. Obviously, there would be a few problems — they wouldn't be able to reveal some things that need to stay mysteries in the main series (cough, Jon Snow's parents, cough) but I imagine that they could pull it off. If nothing else, I'm betting mass audiences might be slightly more interested in seeing Mad King Aerys setting Ned's dad and brother on fire than in watching Dunk and Egg traipsing about Westeros.